Flowstone was tasked with applying a Flowcrete ATB 300 resin chemical protection system to a newly constructed bund. 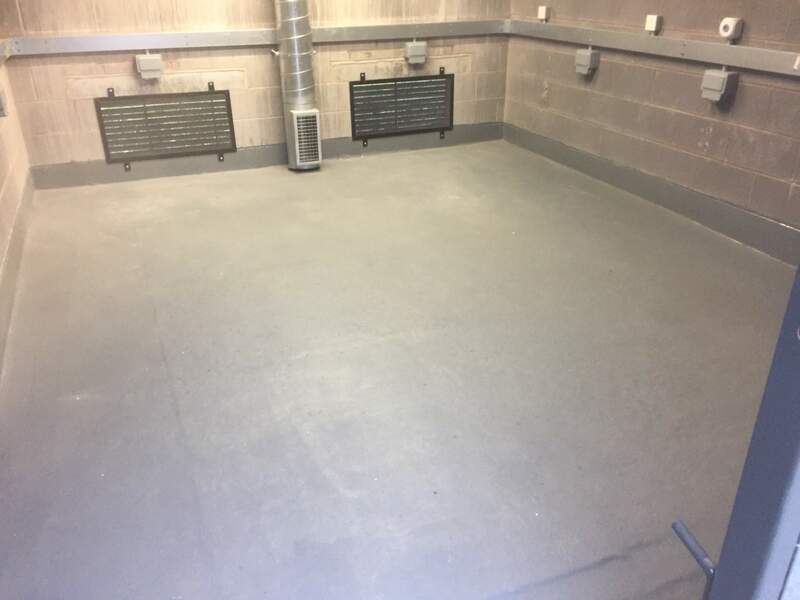 The new bund area will be used to store a range of chemicals at varying concentrations and therefore a high degree of chemical resistance was required to protect the concrete base. How does chemical resistant flooring work? The types of resins we use include roller and spray applied coatings, hand or spray applied glass fibre reinforced linings, horizontal and vertical trowel applied screed and renders. This choice means we can offer a solution for all kinds of environments and substrates, including seamless floor and wall options. Who uses chemical resistant flooring? With the growth in the technology sector in recent years and development of even larger electronics production facilities, the requirement for anti-static flooring as both a first and second line of defence has become more prudent than ever and we are able to offer highly chemical resistant systems which also incorporate anti-static properties. The systems we use have been installed in environments such as gas and power stations, chemical production and storage environments, water treatment plants, engineering and manufacturing. The system installed for Christie’s Hospital was a roller applied shrink free coating system which was installed in a matter of days to reduce downtime and allow the hospital to continue with their new development. The end result is a durable and easy-clean system that gives excellent resistance to the abrasions and impact of containers being moved around the area, and fantastic chemical resistance against any potentials spills or leaks. Environmental legislation places great emphasis on both internal and external protection of chemical storage and production facilities as well as bunding around them. The system installed meets all safety considerations for industrial production and prevention of pollution. Project Quality is guaranteed as Flowstone are part of the global network of Flowcrete ATB-300® specialist applicators. Flowstone is part of the global network of Flowcrete ATB-300® specialist applicators. We are regularly recommended for delivering our projects on time and to budget. We can be called upon to work within hours that do not disrupt your business and all chemical resistant floors are guaranteed for our clients’ peace of mind.